(CNN) - If local Florida officials want to pass firearm restrictions in response to the latest mass killing with an assault weapon, they risk being suspended from office, fined and sued personally for damages. Authorities say Nikolas Cruz, 19, used an AR-15 style rifle he purchased legally to carry out the mass shooting last week at Marjory Stoneman Douglas High School ln Parkland, Florida, that left 17 people dead. The massacre has again pushed the gun control debate to the national forefront. Florida has fewer rules about guns than some states, and a broad state statute gives the state sole authority to regulate firearms. It prohibits any local gun ordinances and allows for personal punishment of officials through fines of up to $5,000, lawsuits and removal from office. Florida law also overrides local ordinances in other areas, such as the environment, but the gun rules are the only ones that allow sanctions against local officials personally, according to one mayor. The law gets mixed reviews. Many in the law enforcement community like the uniformity of statewide rules. Some elected officials feel threatened. "I'm a living testament," to the effect of the law, said Tallahassee Mayor Andrew Gillum, a Democrat running for governor in a majority Republican state. He was sued personally by gun advocates while still a city commissioner after voting against repealing an ordinance that banned shooting firearms in public parks. His defense costs were $200,000, but his lawyers worked pro bono. "Basically, they are suppressing local governments from pushing back, which has a chilling effect," Gillum said. The case ended in an appeals court ruling for Gillum and other city commissioners. The courts did not reach a conclusion on whether the state statute was overreaching. Law enforcement groups such as the Florida Sheriffs Association support state gun control laws. "Counties with 25 cities, it would be impossible to enforce" different ordinances, said sheriffs association President Mike Adkinson. "It would be confusing." He is the sheriff of Walton County, Florida. Opponents of the law say it is the result of the heavy influence of Florida Carry, a gun rights group, the National Rifle Association and the gun industry. Florida gun rights lawyer attorney Noel Flasterstein rejected that claim. "How does the gun industry benefit?" said Flasterstein, consulting counsel for Florida Carry, which supports gun rights. "This statute is beautiful. It holds public officials accountable when they want to break the law." South Miami Mayor Philip Stoddard said the state imposes its authority on more issues than gun regulation. The state is "hell-bent on pre-empting municipalities," he said. To push for more local control over guns or other issues such as environmental regulations "is setting off on a quixotic legal battle," he said. Gov. 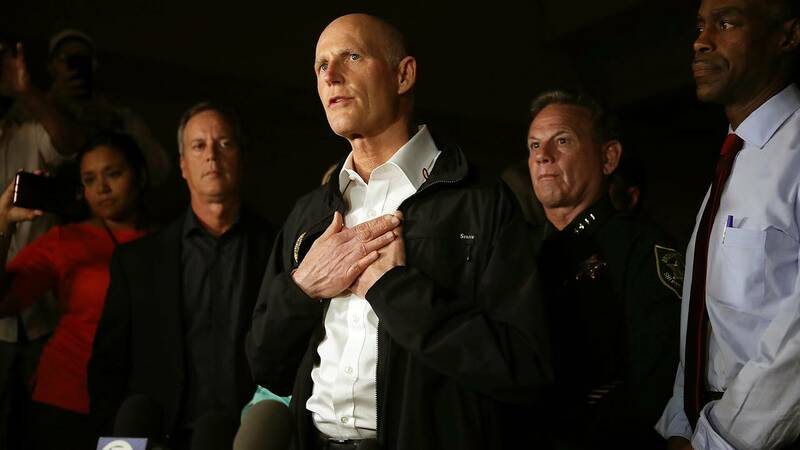 Rick Scott's office did not return a call for comment. While officials argue their points, some Florida residents have their own reaction to the tragedy. They are publicly destroying and disposing of their firearms. Correction: A previous version of this article incorrectly spelled the first name of Nikolas Cruz.